It is possible that some word of me may have come to you, though even this is doubtful, since an insignificant and obscure name will scarcely penetrate far in either time or space. If, however, you should have heard of me, you may desire to know what manner of man I was, or what was the outcome of my labours, especially those of which some description or, at any rate, the bare titles may have reached you. Francesco Petrarch was born shortly after 1300 in a time and place where very few could read or write and those that did considered it a chore where as Petrarch saw a blessing. His passion to write his thoughts to paper was only overcome by the need to sleep or eat. So great was his desire to write his thoughts and feelings and so difficult was it to find anyone in Europe to match his desire he found himself writing to Cicero, one of the only people he believed really shared his passion. (Cicero was a Roman Poet/Politician that died over 1200 years before Petrarch was born). 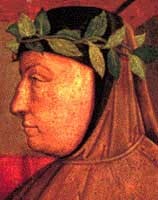 His writings would go on to influence countless others such as Boccaccio to write his own great works. And centuries later others such as Shakespeare would study his works and copy his sonnets. Petrarch lived through the harshest bouts of the plague and lost nearly everyone he knew to it. His mother and father had died in his early years but his son, his grandson, numerous friends and a woman named Laura for which his writings of her will live on forever, all died as victims of the disease. So great were his writings that royalty treated him, the son of exiled nobles, like a king and in a letter to a friend he even goes as far as to say that he has caused his own plague to spread over Europe, one which has caused people to take up pen and paper and write and read. And so ended the dark ages and the start of Humanism.